The Outer Banks of North Carolina is no stranger to national acclaim, appearing on countless “Best Beach” lists and “Top 10” collections. And for good reason. These dynamic barrier islands are spectacular and something to behold. 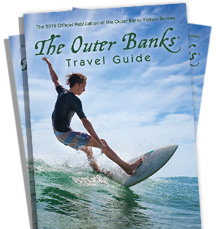 As impressive as the natural setting is, though, the Outer Banks actually holds several national claims to fame because of its amazing attractions. Visitors can enjoy, in relatively close proximity, the offerings of three National Park Service sites; including, the site of man’s first powered flight (Wright Brothers National Memorial), the country’s first National Seashore (Cape Hatteras National Seashore), the country’s tallest brick lighthouse (Cape Hatteras), the first attempted colonization by the English in what would become the New World (Fort Raleigh Historic Site) and home to the first English-born child (Virginia Dare). These are but a few of the Outer Banks national and international distinctions. This area also hosts two National Wildlife Refuges, one of the few remaining original U.S. Lifesaving Stations, a Weather Bureau Station and five lighthouses to view (and three to climb during certain times of the year). The Outer Banks of North Carolina is a land of beginnings and a place where people have stretched their imaginations and abilities for hundreds of years. While your vacation might not involve as much exertion, it’s likely to be just as inspiring.